This enticing collection of 365 recipes offers a salad for each day of the year. From January to December, you'll find daily inspiration and a seasonal salad to satisfy any craving or suit any occasion. From light salads featuring spring vegetables and herbs to garden-fresh greens mixed with summer's bounty, autumn roots tossed with hearty grains to aromatic winter noodle salads--plus protein-packed main-dish salads for any day of the year--a delicious option awaits, With this cookbook as your guide, discover a salad to match each season's ingredients. Vibrant, fresh, and extremely versatile, salads are the ultimate expression of the changing seasons--and make a fantastic meal or accompaniment any day of the year. Capture the essence of spring with a pasta salad featuring sugar snap peas and slender asparagus, or a seared salmon salad with pea shoots and watercress. Savor the flavors of summer with juicy ripe tomatoes and sweet corn kernels tossed with piquant blue cheese, or grilled summer squash on a bed of herbed rice. In autumn, enjoy a warm wild mushroom salad dressed in bacon vinaigrette, or tender chicken salad with crisp apples and toasted walnuts. During the winter, pair bright citrus fruits with skirt steak and peppery arugula, or earthy roasted beets and soft farmer cheese. 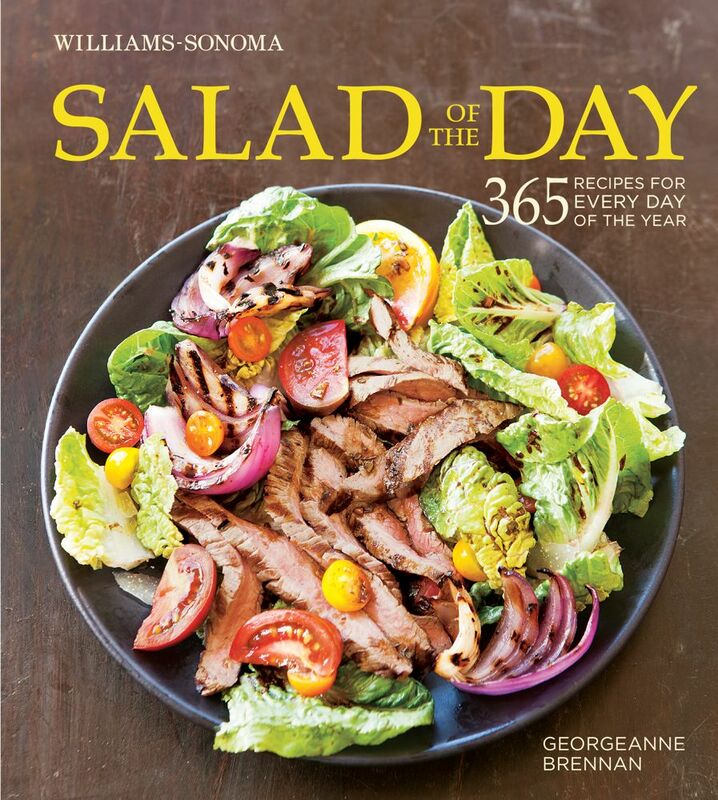 Williams-Sonoma Salad of the Day presents an enticing collection of 365 recipes: one for each day of the year. Colorful calendars at the beginning of each chapter provide an at-a-glance view of the dishes best suited for the ingredients, occasions, and overall spirit of the month. From January to December, you'll find a salad that will satisfy any craving and suit any menu, from light lunch or starter salads to protein-rich main-dish salads to slaws and potato or grain salads perfect for picnics and side dishes. Notes accompanying each recipe offer ideas for ingredient variations, garnishes, and other helpful tips. With this comprehensive book as your guide and the garden's bounty as your inspiration, you'll be prepared to craft the perfect salad for any occasion. Full-color photographs enhance many of the recipes inside to give you a preview of what awaits. You'll be amazed at the wide range of dishes from which to choose--just open this book, check the calendar, and discover an exciting new salad to try. Georgeanne Brennan is an award-winning writer and teacher. She divides her time between her home in Provence and her small farm in Northern California. She is the author or co-author of several Williams-Sonoma titles, including Cheese, Essentials of French Cooking, and Essentials of Breakfast & Brunch, among dozens of other cooking and gardening titles, including her memoir, A Pig in Provence. In addition to her books, Brennan is a regular contributor to the San Francisco Chronicle food section and other publications. Erin Kunkel is an award-winning food and lifestyle photographer who works around the world, and calls the foggy outerlands of San Francisco home. When she's not behind the camera, she can be found gardening, cooking, and dreaming of warm water surf spots. "There's a wonderful range of color and texture here; I get inspired by nearly every recipe!" "Best of all, [the book's recipes] all have a little something—whether it's an interesting ingredient or a smart prep technique—that sets them apart from your average buffet sides."